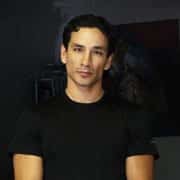 Henry Asencio has been named as ‘Today’s Top Artist’ by the USA association of Art Business News Major Shows for an astonishing four years in a row and his New York exhibitions have sold out every year. He was the first artist to receive both a gold and a silver medal in the prestigious international Amsterdam Art Competition and he was also chosen finalist in an Artist’s Magazine competition for his work in portraiture. He is a huge name in the USA, and his many celebrity collectors include George Clooney, Brad Pitt, Glenn Close, Viola Davis, Martin Scorsese, Woody Allen, Ice T and Coco, Anne Heche, Barry Bonds and Billy Crystal. Asencio’s style has been described as abstract naturalism.He graduated with honours from the San Francisco Art Academy in 1998, and won a range of awards and accolades. A native Californian, Henry lives and works in his studio near San Jose, north of his birthplace of Los Angeles. His work is exhibited and collected all over the world.